What Blank DVD Discs Do You Use In a DVD Recorder? In order to record video (and audio) onto DVD, you need to make sure you use blank discs that are compatible with your DVD recorder or PC-DVD writer. Before you can record your desired TV program or transfer your camcorder tapes to DVD, you need to purchase a black disc to record your video onto. Blank DVDs can be found in most consumer electronics and computer stores, and can also be purchased online. Blank DVDs come in various packages. You can buy one disc, a few discs, or a box or spindle of 10, 20, 30, or more. Some also come with paper sleeves or jewel box cases, but the ones that are packaged in spindles require you to purchase sleeves or jewel boxes separately. Since prices vary according to brand and/or package quantity, no prices will be quoted here. The main thing to remember, as stated above, is to get the correct format discs that are compatible with your recorder, and will also be playable (after recording) on both your DVD recorder and DVD player(s). For example, if you have a DVD recorder that records in the DVD+R/+RW format make sure you buy discs that have that label on the packaging. You cannot use a +R disc in a -R recorder or vice versa. However, many DVD recorders record in both the - and + formats. If so, then this certainly gives you more blank disc purchasing options. If you are not sure what format discs your DVD recorder uses, take your user manual to the store with you and get assistance from a salesperson to help you find the right format discs. In addition, make sure you purchase blank DVDs that are designated for either Video Use Only or both Video and Data use. Do not buy blank DVDs that are labeled for Data Use Only, as these are intended to be used only with PCs. In addition to disc format type, the brand of blank DVDs used can also affect playback compatibility on some DVD players. Also be aware that even if you use the correct DVD format disc for recording, not all recordable disc formats are compatible for playback on all DVD players. For the most part, DVD-R discs are the most compatible, followed by DVD+R discs. However, these disc formats can only be recorded once. They cannot be erased and used over again. 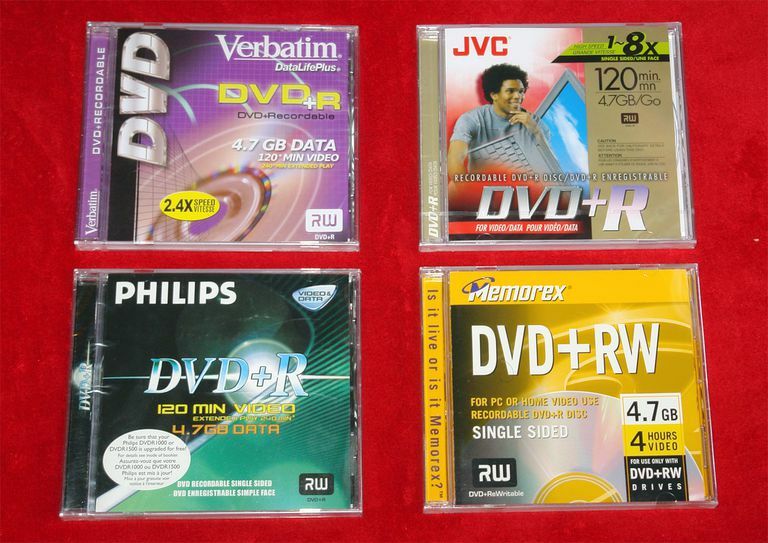 On the other hand, DVD-RW/+RW format re-writable disc format discs can be erased and used again, but are not always compatible with a specific DVD player - and the least compatible disc format is DVD-RAM (which is also erasable/rewriteable), which, fortunately, is not widely used in DVD recording. Disc format compatibility is not the only thing to take into consideration with regards to DVD recording. The record mode you chose (2 hr, 4hr, 6hr, etc...) affects the quality of the recorded signal (similar to quality issues when using various VHS recording speeds). As the quality gets poorer, the instability of the video signal read off the disc, in addition to looking bad (resulting in macro-blocking and pixelation artifacts), may result in unwanted freezing or skipping. When it comes to which blank DVDs to purchase and use, in addition to the correct format, stick with major brands. Also, if you have questions about a particular brand of blank DVD, you can also touch base with tech support for your particular DVD recorder and find out if the manufacturer for your DVD has a listing of brands of blank DVDs to avoid or a list of acceptable blank DVD brands. In addition, before you embark on an extensive VHS-to-DVD transfer project, it is advisable to make a few test recordings and see if you are comfortable with the results. This will assist in determining if the discs (and record modes) you plan to use will work on both your DVD recorder and other DVD players you may have. Also, if you are planning to record a DVD to send to someone, make a test disc, send it to them and see if it will play on their DVD player. This is especially important if you plan on sending a DVD to someone overseas as US DVD recorders make discs in the NTSC system and most of the rest of the World (Europe, Australia, and most of Asia) is on the PAL system for DVD recording and playback.